The first 4 designs for my second coloring book. You may already know that I created a coloring book a couple of years back. As usual, it seems I am ahead of the trends. Lately, I’ve seen articles about the popularity of adult coloring books. Personally, I have always loved to color! When my kids were younger, I would color with them and sometimes fill in books that they had tossed aside. 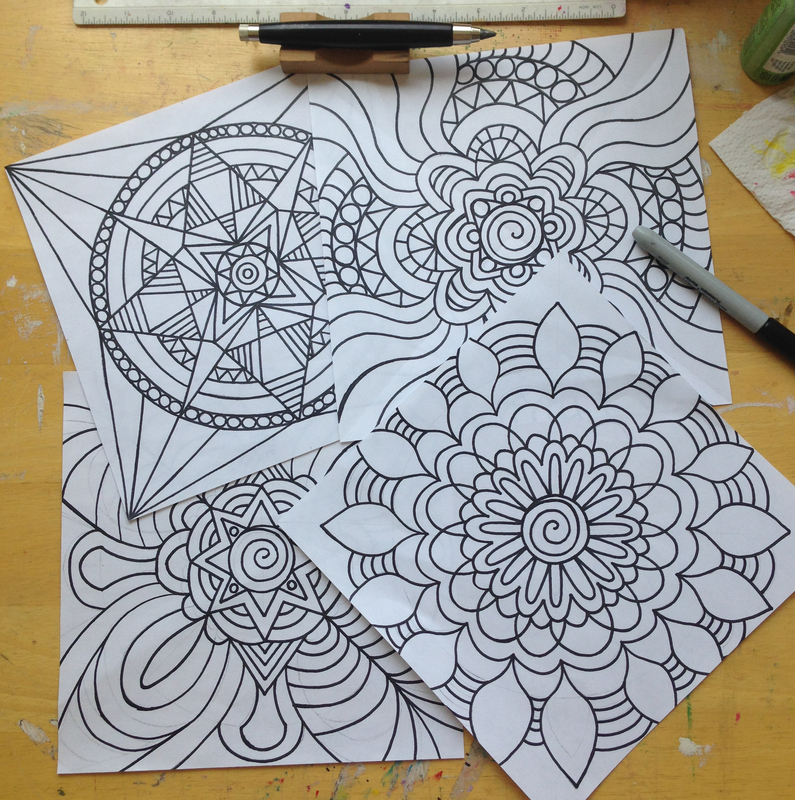 Coloring is a GREAT way to relieve stress and just basically, RELAX! 🙂 Plus, it’s FUN! That brings me to a recent epiphany I had about my art. I have been frustrated recently by my attempts to have my art accepted in the Fine Art realm. For whatever reason, not many people see my art as “Fine” art. This is perfectly fine with me though, as the epiphany I had the other day was the fact that I don’t care if my art is “Fine” art, because to me it’s more about being “FUN”! I no longer worry about my art making it into the “Fine Art” category, it’s “FUN Art”! This entry was posted in accomplishments, art, artist self promotion, design, etsy, Etsy shop, goals, inspiration, new work, new work in progress, original, Originals, progress, spiral art and tagged adult coloring book, adult coloring books, coloring, coloring book, coloring designs, fun art. Bookmark the permalink. I see your work as fine art….love the album covers, your journey as an artist and your passion about art. If I had listened to people and their categories, I may have been in prison, on drugs, and worse. Keep doing what you do, the way you do it. Power to the artists for creating.